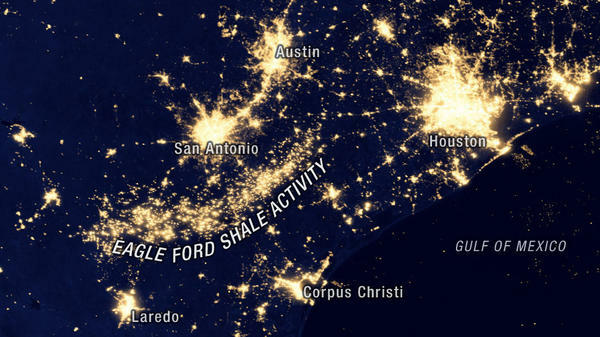 This nighttime NASA satellite image from 2012 shows lights from drilling sites and natural gas flaring along the Eagle Ford Shale. 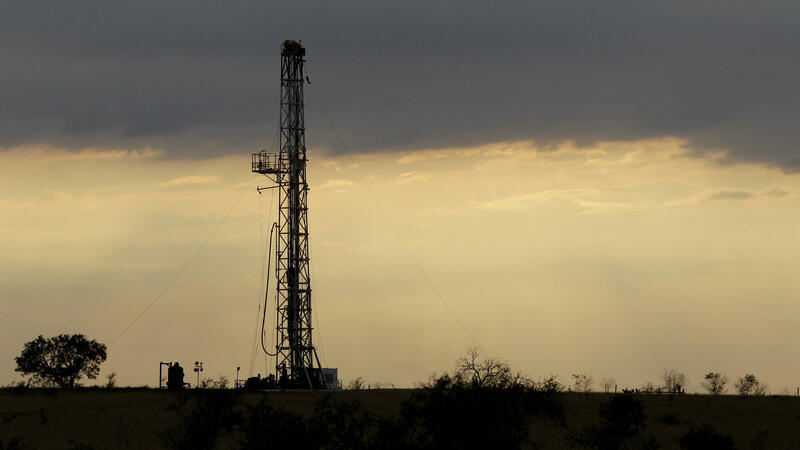 More than 8,000 oil and gas wells have been drilled along the Eagle Ford Shale formation in six years. 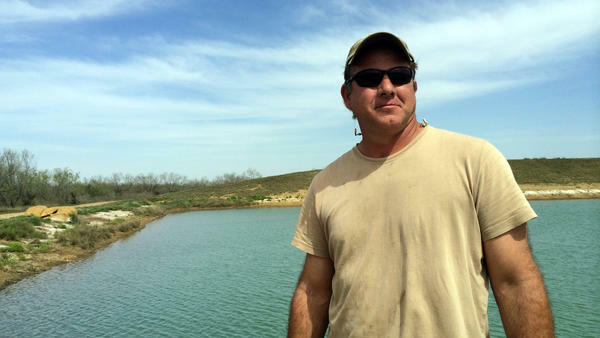 Rancher Darrell Brownlow stands in front of the pond Chesapeake Energy dug on his land when he leased part of it to the company. It will allow him to irrigate, and the oil money means he can afford to rebuild the ranch and bring back the cattle. Before the boom, jobs were few and poverty was high. Then, in 2008, oil company Petrohawk drilled the first discovery well, 2 miles deep into shale. It was successful and led to a drilling frenzy. Now after just six years, more than 8,000 oil and gas wells have been drilled, with permits granted for 5,000 more. They're pumping more than 1 million barrels of oil a day, making it the No. 2 oil-producing region in the U.S. Train cars roll into the Gardendale rail yard bearing miles of pipe and vast quantities of the chemicals and sand used in hydraulic fracturing, known as fracking. Cotulla City Manager Larry Dovalina is overseeing the money as the city's coffers fill. "It was a rural town and like rural America, it was dying — dying on the vine, as they say," he says. Dovalina has seen city revenues from sales taxes rise nearly nine-fold in six years. The property tax base has risen from $50 million in 2008 to nearly $200 million, with the end far from sight. Those revenues will go to beef up infrastructure — water, gas and roads — which are all under intense strain with the sudden growth. For those who've leased mineral rights on their land to the oil companies, it's meant a windfall. Dovalina says he heard a story of a man who wanted to quickly deposit a $100,000 check because it was making him nervous. "And when the clerk looked at the check, she said, 'It's not $100,000. It's $1 million,' " he says. The Eagle Ford boom has brought with it lots of complaints about the heavy truck traffic. And with the influx of thousands of outsiders, the sheriff's department is contending with a spike in crime: theft, drugs and prostitution. Sgt. Rickey Galvan was born and raised in Cotulla in a very different time. "Before, a handshake meant something down here — not anymore," Galvan says. "Now you have to lock your doors, so you have to lock your car, take your keys before you go to the store. Before, you didn't have to do that. You walk into the store, leave your vehicle running. Not anymore; it's changed." And what will the future of towns like Cotulla look like? Texans know well the cycles of boom and bust — many places that were once the hot new thing for oil exploration are now ghost towns. That's the fate former Cotulla mayor and judge Leodoro Martinez hopes his town can avoid. "This is where my family grew up," he says. "My grandparents worked these lands." They were sharecroppers and Martinez grew up picking cotton, watermelons and onions. Now some of that old farmland is being turned into a sports park that will bear his name. The transformation doesn't end there. Bright orange gas flares burn high above the ranch land and pumpjacks dip to the ground, like giant mechanical birds. Semis barrel down the roads, carrying gravel and sand and pieces of rigs in; oil out. There are now 19 hotels where there used to be three. "Somebody knows something because they keep building them," Martinez says. "Everybody is concerned at the end of the day that there's going to be a lot of hotels and not enough business." Martinez thinks a lot about where this is all heading. He's chairman of the Eagle Ford Consortium, a group of local stakeholders who are working with the oil companies to make the most of economic development and try to keep it sustainable. "I've always called it wanting to be normal; you know, having what other communities have," he says. Darrell Brownlow, a rancher, has also had a close-up view of the oil industry's intersection with the land. Brownlow and his father used to run cattle on 1,000 acres, but Brownlow had to sell off his herd with the drought. Now he's leased part of the land to Chesapeake Energy. The company has dug a deep well on the dusty ranch and a 3-acre pond to supply water for fracking operations. It's a rare thing to have in drought-stricken Texas. It will allow Brownlow to irrigate, and the oil money means he can afford to rebuild the ranch and bring back cattle. "It's progress — it has provided opportunity beyond belief; beyond what anybody could have imagined," he says. While out on the ranch, Brownlow points to two pumpjacks. Gas is flaring off nearby with a sign warning of possible emissions of poison gas — the extremely toxic hydrogen sulfide. There are, of course, a lot of environmental and health concerns that accompany fracking. Jim Morris spent months reporting on air pollution connected to the oil industry in South Texas and the health effects on some residents. Morris is with the Center for Public Integrity and led the eight-month investigation with InsideClimate News and The Weather Channel. He describes the emissions from Eagle Ford Shale fracking as "a toxic soup of chemicals" that include benzene, formaldehyde, sulfur dioxide and more. "We reviewed about 300 complaints that had been filed by citizens of the Eagle Ford with the Texas Commission on Environmental Quality," he says. "Headaches, nausea, breathing difficulties, nosebleeds. And when you look at the science on some of the chemicals that are coming out of these operations, you see those are the very symptoms that would be expected to be associated with emissions from the oil and gas industry." He says the commission has a poor track record for monitoring toxic chemicals in the air and enforcement. Those in the oil industry say there's no evidence the emissions cause any harm. You can hear Melissa Block's interview with Morris on Friday's All Things Considered. And today, we're heading to South Texas, which is in the midst of a massive oil boom. In just a few years, that boom has totally transformed once-sleepy communities along a crescent swoosh known as the Eagle Ford Shale. BLOCK: The oil boom has brought a long-dormant rail line back to life. It's become a vital artery. In the heart of the oil boom along the Eagle Ford, the boom has brought unexpected prosperity and a host of new concerns. We're southwest of San Antonio, about 70 miles up from the Mexico border. Brush country, they call it, flat, dry ranchland scrubby with mesquite and parched by drought. Before the boom, jobs here were few, poverty, high. Then, in 2008, the oil company Petrohawk drilled the first discovery well two miles deep into the Eagle Ford Shale and hit big-time. When they announced their success it led to a drilling frenzy. Now after just six years, more than 8,000 oil and gas wells have been drilled along this shale play, with permits for another 5,000. BLOCK: They're pumping more than a million barrels of oil a day from the Eagle Ford, which has quickly vaulted to become the second highest oil producing region in the U.S.
BLOCK: Train cars roll in to the Gardendale rail yard bearing miles of pipe, drilling mud, vast quantities of the chemicals and sand used in hydraulic fracturing, or fracking. And the numbers are mind-boggling. Rail yard General Manager Del Randall drives me around in his pickup and points out a Halliburton storage site. DEL RANDALL: That facility, in the first eight months of operation, moved a billion pounds of frack sand. BLOCK: Randall has seen this rail yard turn from a wasteland to a sprawling hub of commerce. RANDALL: This is probably one of the most extensive facilities like this in the country. BLOCK: And really up from just about nothing. BLOCK: To hear how the sudden oil boom has changed the nearby town of Cotulla, Texas, I stop by a modest storefront on a largely abandoned block that serves as Cotulla City Hall. LARRY DOVALINA: I mean it was a rural town. And, like rural America, it was dying, dying on the vine, as they say. BLOCK: Larry Dovalina is city manager overseeing the money as Cotulla's coffers fill. He's seen city revenues from sales taxes rise nearly nine-fold in six years. Back in 2008, the property tax base was about $50 million. DOVALINA: It's going to be somewhere close to $200 million this year. BLOCK: And he projects it'll double again. The revenues will go to beef up infrastructure, water, gas, roads, all the things that are under intense strain with this sudden growth. For people who leased mineral rights on their land to the oil companies, it's meant a windfall. Larry Dovalina recounts a wild story he heard. DOVALINA: This guy took a check to the bank and he told the lady he needed to put check in the bank right away, because it was a check for $100,000. And when the clerk looked at the check she says: Its not $100,000; it's a million. And those stories happen here, too. JAY WATSON: That was true. My wife worked at the bank. WATSON: I can verify that story. BLOCK: That's Jay Watson with the Cotulla Chamber of Commerce. WATSON: It's what they call mailbox money around here. Check comes in the mailbox and you go to the bank, put it in the bank. BLOCK: Jay Watson and his colleague Marianne Hall have both leased land to the oil companies. It's allowed him to buy a retirement home. Lots of people here have money now they never dreamed of. WATSON: I know of one family, an old ranch family that I think they got, like, $30 million just in bonus money. So they went from trying to make ends meet to multi-millionaires in three years. BLOCK: People talk about it? I mean is it sort of known who's come into a huge windfall? MARIANNE HALL: You see a new car and you see a house go up. Or, you know, so you know they've got a little bit of money coming, anyway. WATSON: We bring them back to Earth pretty damn quick. BLOCK: Marianne Hall thinks back to the early days of the boom, which came on so fast, nobody was ready. HALL: I would get a call from a guy coming in with a pipeline crews seismic with 60 people coming in the next day, where do we stay? And you go: Oh, my gosh, there's nowhere. There was not enough hotels. There was nothing so they started putting RV parks and RVs in their yards and field cabins and things like that for them. And that's what happened. It had to grow quick. BLOCK: Do you worry this is all going to dry up? Go bust? BLOCK: The main complaints you here in Cotulla are about the heavy truck traffic the Eagle Ford boom has brought with it: 18-wheelers chewing these rural roads and causing accidents, a number of them fatal. And with the influx of thousands of outsiders, the Sheriff's Department is contending with a spike in crime: theft, drugs and prostitution. Sergeant Rickey Galvan pulls up in one of the Sheriff's Department shiny, new Chevy Tahoes. He was born and raised in Cotulla and remembers a very different time. SERGEANT RICKY GALVAN: Before, a handshake meant something down here, not anymore. Now you have to lock your doors. So you have to lock your car, take your keys if you go to the store. Before, you didn't have to do that. You walk into the store, leave your vehicle running. Not anymore, that's changed. BLOCK: And what will the future of towns like Cotulla look like? Texans know well the cycles of boom and bust, places that were once the hot new thing for oil explorations that are now ghost towns. And that's the fate former Cotulla Mayor and Judge Leodoro Martinez hopes his town can avoid. He takes me out for a drive and we talk about his deep roots here. JUDGE LEODORO MARTINEZ: This is where my family grew up. MARTINEZ: My grandparents worked all these lands. BLOCK: His grandparents were sharecroppers. Martinez grew up picking cotton, watermelons, onions. Now some of that old farmland is being turned into a sports park that will bear his name. MARTINEZ: All of this was just empty. There was nothing here. BLOCK: But now, pump jacks dip to the ground, like giant mechanical birds. Bright orange gas flares burn high above the ranchland. You'll see huge tank batteries for oil storage and disposal wells for their fracking fluids. And we pass one motel after another, 19 already up for being built where there used to be just three. MARTINEZ: Well, yeah. Look at that. Yeah. Somebody knows something because they keep building them. We can't quite figure it out. Everybody is concerned that at the end of the day, that there's going to be a lot of hotels and not enough business. But I'm sure somebody knows something. BLOCK: Leodoro Martinez thinks a lot about where this is all heading. He's chairman of the Eagle Ford Consortium, a group of local stakeholders who are working with the oil companies to try to make the most of economic development and try to make it sustainable. MARTINEZ: I've always called it wanting to be normal. MARTINEZ: You know, having what other communities have. BLOCK: So your hope would be that the oil money could help you do that. MARTINEZ: Yes. In my lifetime we're never going to see another opportunity, I mean to be able to get there. It's not going to happen. BLOCK: Our last stop in Cotulla takes us to Darrell Brownlow's thousand-acre ranch. DARRELL BROWNLOW: Now you see a roadrunner crossing road in front of U.S.
BLOCK: Here you get a clear sense of the tradeoffs the oil industry brings. Brownlow's grandfather bought this land in the 1940s. Darrell and his father used to run cattle here. His father died last year. And with the drought, Darrell had to sell off his herd. Now, he's leased part of his land to Chesapeake Energy. BLOCK: Brownlow takes me by the two pump jacks working. Gas is flaring off nearby with a sign warning of possible emissions of poison gas, the extremely toxic hydrogen sulfide. BROWNLOW: There's a siren, you know if there was an upset condition that would wail. BLOCK: As we drive passed mesquite trees and a white-tailed deer bounding away, Brownlow looks out at the industry that's sprung up all around him. BROWNLOW: And you can see the flaring over there. And at night, it's quite a site when you get up on top of the deer blinds, and you can see these little glowing embers you know, all over. Historically and at night when you climb up in the deer blind, you watch the sunset, you know it was nothing as far as you could see. It was beautiful. BLOCK: Does that bother you in any way? I mean, when you think about how it used to be, right, just open space. And now, you're looking around and you're seeing industry mixed in all - everywhere you look, all around you. BROWNLOW: It's progress. It has provided opportunity beyond belief, beyond what anybody could have imagined. BLOCK: Chesapeake Energy has dug a deep well on this dusty ranch, and a three-acre pond to supply water for fracking operations. That's a rare thing to have in drought-stricken Texas. It'll allow Brownlow to irrigate, and the oil money means he can afford to rebuild this ranch and bring back cattle. BROWNLOW: I think of my dad, almost a testament. Dad, we're gonna get the cattle back on here. And he's not here with us, but Pop is upstairs looking down at us and he's going to be happy about it. And we got one shot at this and you got to make sure it's done right. You know, what's this place gonna be like 20 or 30 or 50 years from now? It's what we do with it today that matters. BLOCK: There are, of course, a lot of environmental and health concerns that accompany oil production in operations like those along the Eagle Ford Shale. Tomorrow on the program, I'll talk with an investigative reporter who spent months reporting on air pollution connected to the oil industry in South Texas and the health effects on some residents. JIM MORRIS: Headaches, nausea, breathing difficulties, nosebleeds. And when you look at the science on some of the chemicals that are coming out of these operations, you see those are the very symptoms that would be expected to be associated with emissions from the oil and gas industry. BLOCK: We'll have that conversation tomorrow. You're listening to ALL THINGS CONSIDERED from NPR News. Transcript provided by NPR, Copyright NPR.